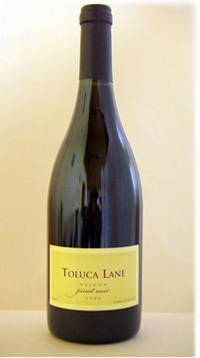 Our 2.4 acre Toluca Lane Vineyards are tightly spaced, 5.5 feet by a meter, and house 5,556 vines. We are located at an elevation of 650 feet in the Walnut Hill area of the Eola-Amity Hills AVA. 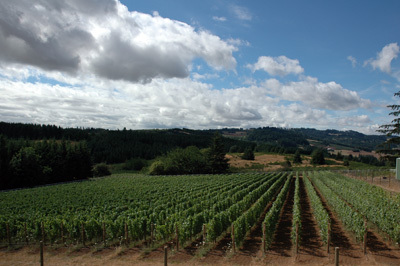 Two of the predominant influences of the characteristics of the wines from this area are the shallow Nekia soils and the Van Duzer corridor. The Nekia soils primarily contain weathered volcanic basalt from ancient lava flows. These shallow, well drained soils tend to produce smaller grapes with greater concentration of flavor. The Van Duzer corridor is a break in the coastal range that allows cool ocean winds to flow into the area dropping afternoon temperatures. These afternoon and evening breezes help provide the cool nights that keep acids firm and are essential for optimal ripening.